A Tent or a Tomb? I wasn’t sure what to title this entry: another overnighter on the dinghy, ride ‘em cowboy, two extremes, 3 seconds of terror or what? You see what I decided and I’ll get to it a little later. Suffice it to say that trouble can come most unexpectedly. I had been looking for an opportunity to try out my new tent that Santa brought me for cruising on Little Bit. After a week of rain, there was a two-day window that looked like it might work; so I went for it. The forecast was for SW winds at 10-20 mph with about 20% chance of an afternoon shower with some possible lightning. We had been hit with some severe weather and were on the trailing edge of that weather. It was a bit risky; but I figured the worst that could happen was I’d capsize, lose the boat, and have to be rescued. Hey, why not? I got to the ramp by the Chickamauga Lake dam a little after lunchtime. I figured I’d reef even though the wind would be at my back. I had never reefed Little Bit before but knew that reefing her sprit rig on the water would be extremely difficult in high winds, and I wanted to be as safe as possible: I’ve had too many incidents in my sailing experience and sure didn’t want to add to the list (knock on wood). I normally launch my dinghy from the ramp versus from the pier. I push her off the trailer, pull the bow up onto the ramp and park my rig. When I return, I climb to the stern seat which lifts the bow and I can row away. The ramp faces due north. 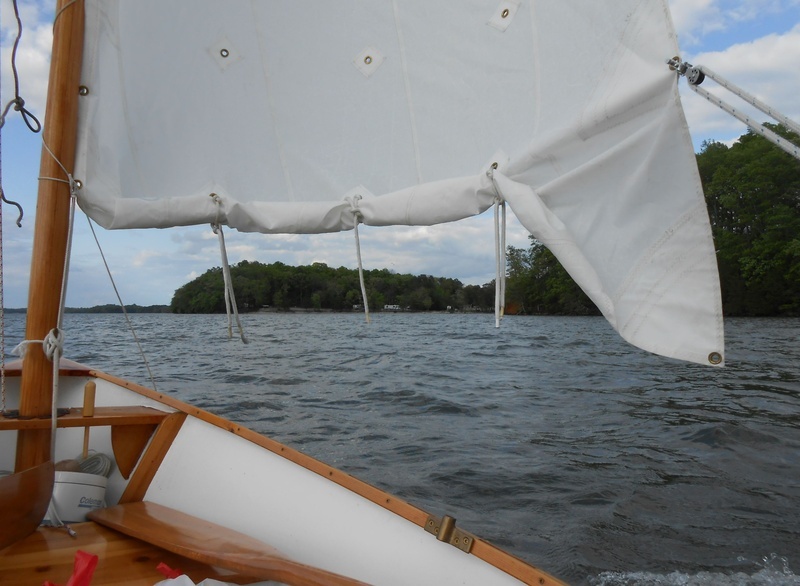 As soon as I got into the boat, the southerly wind gusted, grabbed the sail which was loosely furled around the mast, quickly turned the boat around 180 degrees and we were headed out into the lake. It happened so quickly I was taken by surprise. Never left the ramp like that! Not that I needed to, but I decided to row out a little way just to be sure I had cleared a couple of buoys. When I went forward and untied the sail, the wind was so strong that it immediately wrapped the sail around the mast and the reefing lines all came loose. Oh, well. In that wind there was no way I was going to try to fix anything, so I just made do. I headed northeast and sailed for a while with the bottom of the sail flapping. It actually wasn’t too bad: it just didn’t look too seamanlike, and the wrapped sail actually acted like a second reef (I’ve got to rationalize it somehow). After about an hour, I decided to duck into a small cove that provided shelter from the wind so that I could straighten out the sail and retie the reef. With those little tasks completed, and after stretching my legs a bit, I headed back out. On the water it took my constant attention to keep Little Bit sailing. The winds were brisk to say the least. After the trip, I checked the Weather Underground almanac; it reported winds of 10-24 mph with 34 mph gusts. I was not comfortable trying to take pictures except for one. The wind slacked off a little as I was abeam of Harrison Bay State Park. Next time I reef, I will tie off that loose clew to the first reef point. It's just too short to tuck. I had picked out 3-4 possible anchorage sites, depending on how far I was able to sail, which would offer protection for the night. 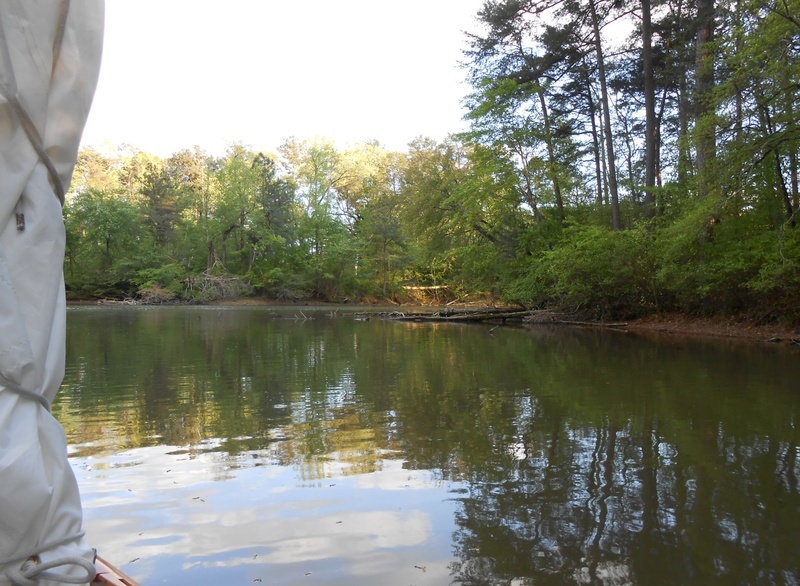 I made it 12 miles up the lake and settled on a cove on the north side of Bear Trace Golf Course. It was a welcome break after 3 plus hours of getting tossed about by a very lumpy lake which included two foot waves passing under me at times during the downwind sail. At no time did I ever feel that I was in trouble, but there was no turning back into that wind. I could have ducked for cover, but it was a test I wanted to take. I wrapped up the sail and rowed around the cove looking for a good spot to anchor. I thought about going ashore and walking the golf course for a few minutes, but the shoreline was pretty thick. Eventually, I rowed up a little finger dodging some fallen trees and tied off the stern to one of them that lay across the end of the finger. To be sure, I inspected the tree thoroughly for any serpentine life forms before doing so. I then rowed back out a bit and dropped an anchor off the bow. The anchoring arrangement would keep me from swinging during the night. When all was said and done, I was only about 10’ from the shore in about 5’ of water. I settled in for the evening. After a supper of air temperature Chef Boyardee Pepperoni Pizza Ravioli and a dessert of Grandma’s oatmeal raisin cookies (they’re truly the best) washed down with some H2O, it was time to pitch the tent. Now, I had done it dry sailing; but I was a little concerned about doing it afloat in a dingy with a narrow beam rocking in the water. It actually went up pretty easily. I started by “building” my sleeping platform. Next – the tent itself. Since the 4 corners are not staked down, I was able to “accordion” the tent until I was ready to open it up and get into it. Once I threw everything into it that I would need for the night, I was able to sit inside the door of the tent and leave my feet outside straddling the center thwart which is where I sat until dark. Being a one person tent with a width of only 28”, it is tight inside; but it fits the inside dimensions of my dinghy. I took along a couple issues of a sailing magazine and read through one using a new headlamp I had received for Christmas while being serenaded by a chorus of chirps, chatter, and croaks by the local choir. Finally, it was time to retire for the evening. It was a bit tricky getting into my sleeping bag but I managed. To get an idea of how narrow the tent is just notice that the sleeping bag is still doubled up to half its width. The most notable part of the whole setup is the high center of gravity sleeping on an elevated platform. Any movements have to be done with that in mind. Along about 4:30 in the morning I needed to move around some and straighten out my sleeping bag. Somehow in the process (I was not fully conscious mind you at that time of morning) I got too far to one side of the platform and the boat heeled dramatically. It was like I had crossed an imaginary line (and by the laws of physics I had). Of course, the tent is nylon and slippery and when the boat heeled I slid sideways increasing the angle of heel. And now comes the 3 SECONDS OF TERROR! At that moment I became fully conscious. For just a split-second it was like I was in a car balanced and tottering on the edge of a cliff: one wrong move and over she goes. After a hard day’s sail in the most trying conditions I have ever sailed in and here I was about to drown in 5 feet of water only 10 feet from shore inside a tent that I thought for sure was going to become my watery tomb. I do not know how she stayed on her feet or how I managed to get back to the centerline without capsizing the dinghy, but I did and Little Bit came back to level. Talk about relief! It’s not spelled r-o-l-a-i-d-s. It’s spelled D-R-Y!! The words of our good friend Howard Rice (I consider him a good friend to all small boat sailors) immediately came to my mind. To paraphrase, he said when sleeping on a small boat you need to be able to get out in a matter of seconds. You cannot afford to get trapped! I do not know what would have happened had the boat capsized. Would I have been able to get out of the bag and out of the tent in time? Even in relatively shallow water would I have been able somehow to stand? Honestly, I do not know. I’m thankful I didn’t have to find out! Needless to say, I didn’t sleep much after that and I was very careful to keep my weight on the centerline. When I got out of the tent at daylight, there was a little bit of water in the floor: not a lot but it seemed to be too much for just dew. I don’t think it rained. Every time I looked out the tent window I could see the stars. Did I come so close as to actually take in some water? Wow! Enough drama. 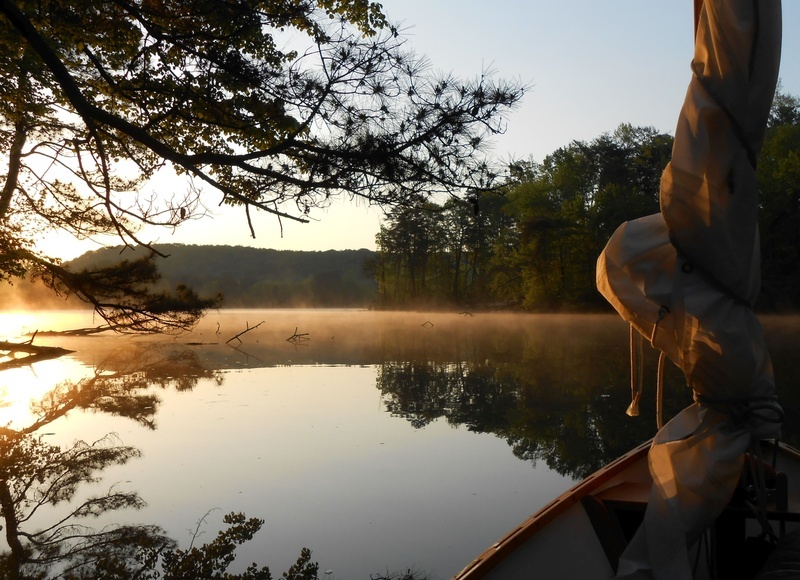 As I sat with my hind-end in the tent and feet outside on the floor of the boat contemplating the events of the night and planning for the day, in the faint dawn light I noticed something swimming in the water about 20 yards away. It was swimming away from me and at first thought I figured it must be an otter. About that time it made a 90 degree turn toward shore, reared its head and smacked the water with its tail. It was a beaver letting me know whose turf I was on! How neat and what a treat. After eating my breakfast of a Little Debbie cinnamon roll, the sun popped up. It provided an absolutely beautiful, idyllic scene; one I was fortunate enough to capture with my Nikon Coolpix which had been safely stored in a waterproof box. By 8:00 o’clock I had my gear put away (if you can call it put away), the reef shaken out, the anchor weighed and the shore-line untied. The forecast was for near calm conditions and some late morning light NW wind which would have me pinching, followed by a westerly breeze on the nose in the early afternoon. None of that sounded good for the trip back to the ramp – at least in sailing terms; but return I must, so I settled in for some rowing. As the beautiful sunbathed morning unfolded, the forecast was just about right on, all except the NW wind which never really developed. I wound up rowing 11 of the 12 miles back, and the one mile that I sailed can hardly be called sailing: most of us call it ghosting. I’ve done little rowing in my time but at about 10’ per stroke I figure I got in somewhere around 6000 strokes (man, am I going to be sore tomorrow). One thing I did learn was the semi-dory tracks better with the rudder in the water. About a mile from the ramp that west wind kicked up. I took down the mast to cut resistance and made it back in without incident. It was good to stand up and move around after being in an 11’ boat for 20 hours. What a trip! Another overnighter? Yes. Ride ‘em cowboy? Yes. Two extremes? Sailing hard and rowing in a calm, yes. Three seconds of terror? Yes and double yes! A tent or a tomb? Thank the Lord, NO! In the meantime, I will say I need to rethink the sleeping setup. If I’m on Little Bit, I will never sleep inside a zipped-up sleeping bag again and will certainly never sleep without my PFD securely fastened on my person! Furthermore, I have already been thinking about building another boat which would serve my purposes better. Right now John Welsford’s Walkabout is the leading contender. She is designed specifically with an open floor plan to allow for sleeping and keeping the center of gravity low. She would also be a better rower than the dory. This excursion has given me a much greater appreciation for those who do those long distance trips like the FL120, TX200, and Watertribe events. 24 miles in about as many hours only begins to describe what those sailors do. And the way my bottom felt after the trip, I can only begin to imagine how theirs must feel after several days of what I just experienced. The manager merry-go-round has never worked for us.